Trump's fears that rising gasoline prices will impact consumer behavior have come true. 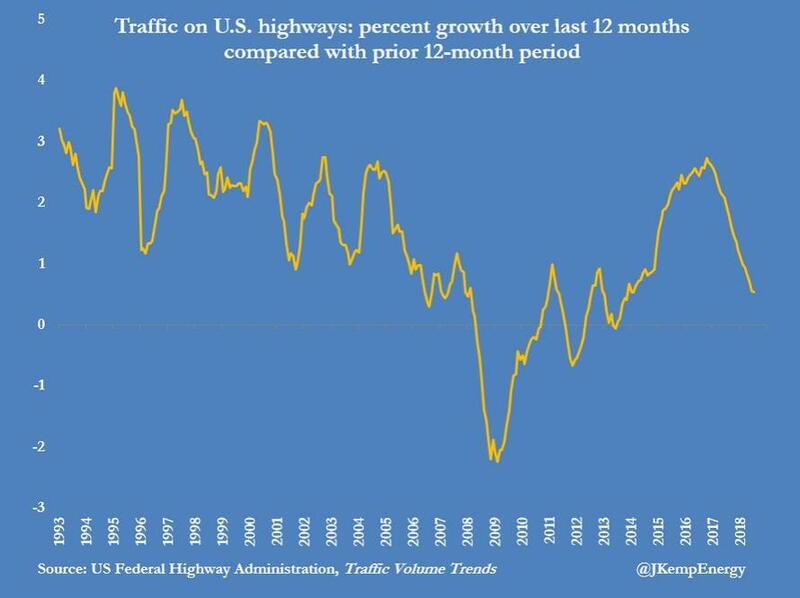 The volume of traffic on U.S. highways has stopped growing, alongside gasoline consumption, as rising prices are starting to curb driving behavior, a new analysis by Reuters' energy analyst John Kemp shows. 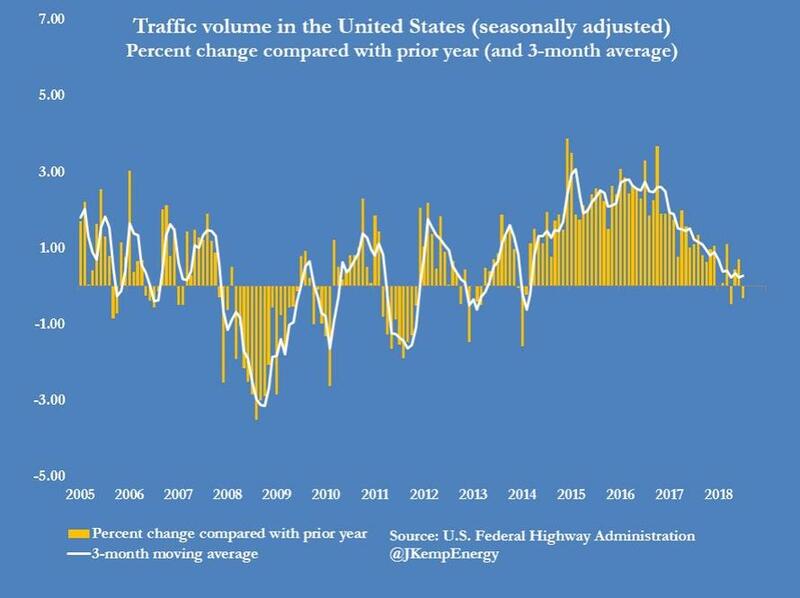 Traffic volumes in July were 0.3% lower than a year earlier, after seasonal adjustments, the latest Federal Highway Administration data showed. Traffic growth has been negative in two months so far this year, the first readings sub-zero prints since the start of 2014. Meanwhile volumes were up by less than 0.3% in the three months from May to July compared with the same period a year earlier, down from annual growth of 2-3% throughout 2015 and 2016. 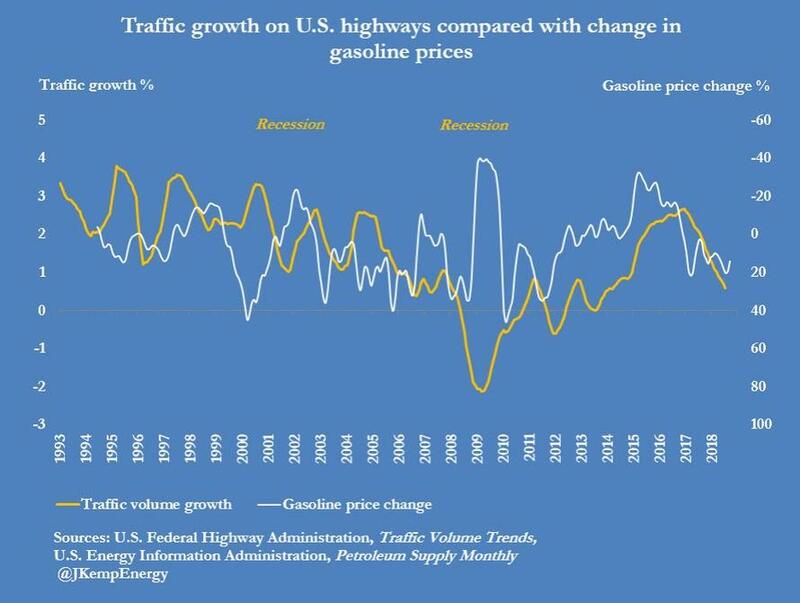 It will come as no surprise that there has been a correlation between traffic volumes and the cyclical rise and fall in oil and gasoline prices since at least the early 1990s. While traffic volume dropped in 2013 and again in mid-2014, the sharp decline in oil prices between the middle of 2014 and early 2016 provided a tremendous boost to vehicle use. But as oil prices have recovered over the last 30 months, that stimulus has faded and traffic growth has once again slowed to a crawl, and in fact turned negative. The reason: the average cost of gasoline purchased by U.S. motorists surged by more than 55% between February 2016 and September 2018. Separate data on gasoline consumption showed a similar plateau as higher prices encourage motorists to limit fuel use. Gasoline consumption rose by just 18,000 barrels per day in the first half of 2018 compared with the same period a year earlier, despite strong economic growth and substantial job creation. Looking ahead, and assuming no material change in gas prices, the U.S. Energy Information Administration predicts consumption will decline by around 10,000 barrels per day this year. Meanwhile, if oil prices continue to rise over the next 12 months, as many traders and hedge funds expect, traffic volumes and gasoline consumption are both likely to turn increasingly negative. But what is most worrisome, is that the flattening of U.S. gasoline consumption resembles the run up to oil price peaks in 2007/08, 2011/12 and the first half of 2014. 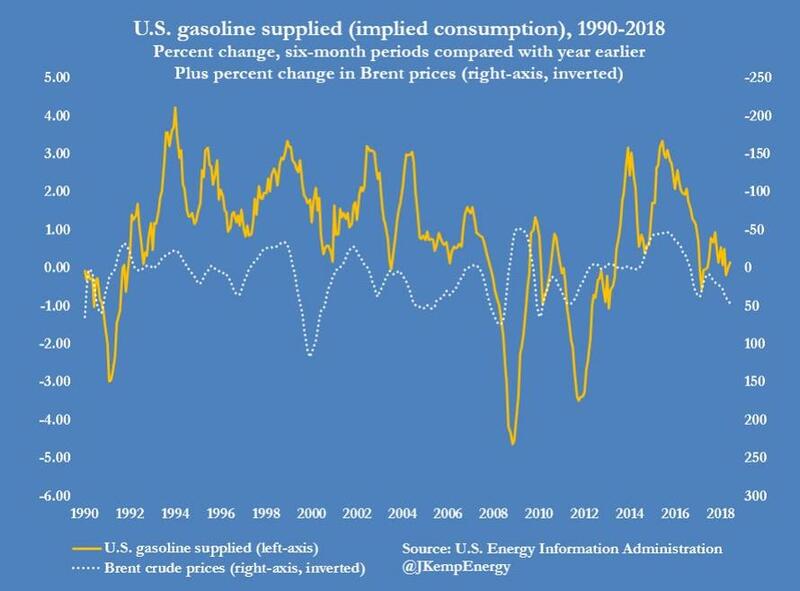 And while it would be difficult to extrapolate broad economic conclusions from these observations, John Kemp points out that in each case, the flattening of U.S. gasoline consumption preceded a sharp downward move in international oil prices after the market overheated. Considering that many analysts and trader are increasingly open to the idea of a $100/barrel superspike in prices if the bulk of Iran oil exports are taken off the market, a sudden spike in gasoline prices may be just the straw that breaks the camel's back of the US consumer, who while extremely confident, is increasingly forced to pick between filling up the car and spending money on other discretionary, or staple, purchases.